For Shelby County Seniors Only, 55 years and older. Please read these instructions carefully and follow them or you may not receive service that day. Starting at 1 p.m. in the Washington Street Plaza (across from the old Major Hospital) Shelbyville. Gleaners reserves the right to cancel if weather conditions are not suitable, such as lightening, heavy rain or extreme heat. WSVX radio will carry the announcement as soon as the decision is made. Look on Shelbyville Horizon Center Facebook page for information and changes. Please read these instructions carefully and follow them. Parking lot opens at 11 a.m. Enter from Jackson Street into the parking lot. The area around the truck location will be roped off. All who wish to get in line will need a numbered clothespin from the registration table. This should be clipped to the collar of the participant. Gleaners allows one person per household to receive food from the truck. Please bring your picture I.D. There are no financial requirements for this pantry but only Shelby County residents will be served. For safety, all children must remain with the car with a supervising adult. Client may have one person accompany them to the truck to help carry food (MUST BE 18 YEARS OF AGE OR OLDER) CLIENT MAY BRING A GROCERY CART OR WAGON T HELP CARRY FOOD. FOR YOUR CONVENIENCE, WE SUGGEST THAT YOU ALSO BRING ANY BOXES OR BAGS YOU THINK YOU WILL NEED. We offer the opportunity to drive-up and load food in the designated area, please drive slowly to insure the safety of clients and volunteers. Date & Time:Monday to Friday at 11:00 a.m. Registration OR Cancellation: Must be made by 11a.m. ONE WEEK IN ADVANCE of the meal, 317-398-0127. Persons under the age of 60 are more than welcome to accompany a senior to the lunch program. The cost of the meal for a person younger than 60 years of age is $6. Reservations are required. Date & Time: Friday at 11:00 a.m. Registration OR Cancellation: Must be made by Wednesday the week before the meal, 317-398-0127 or stop by the front desk. Meals will be prepared by Major Hospital and delivered to Shelbyville Center. Special diet meals will be available if requested in advance. Menu can be found at the Shelbyville Horizon Center. No one will be turned away if reservation has been made. Meals on Wheels in Fairland/Boggstown areas is off and rolling! We need volunteers from the Fairland area who are interested in delivering hot meals to their home‐bound neighbors! Meals will be picked up in Fairland and delivered for noon meals. We will work out schedules when we know how many volunteers we have available! You will be trained; call 317-398-0127 to get an application. This is a new service available to this area – collaboration of Meals on Wheels, SCUFFY, Shelby Senior Services, and Major Health Partners. We need your help identifying those who need meals and help delivering the meals! Vouchers are available at Senior Services for the CICOA Aging & In-Home Solutions nutrition program offered in cooperation with Major Hospital, Grandma’s Pancake House and The Horizon Center to give seniors in Shelby County more choices for breakfast, lunch, and dinner by utilizing the services of Major Hospital. Vouchers are redeemable at Major Hospital’s cafeteria Monday-Friday. They can be redeemed at Grandma’s Pancake House at anytime throughout their hours. To be eligible, seniors must be 60 years of age or older. There are no income restrictions.For a suggested contribution of $3 each, seniors will receive up to five vouchers per month. Special menus have been designated for the program. Additional items may be purchased for full price. CICOA also offers a voucher program that enables individuals age 60 and over to have more options and increased flexibility in their dining choices. For a suggested contribution of $3.00 each, seniors can receive up to eight vouchers per month that may be redeemed at hospital cafeterias for breakfast, lunch or dinner. Community Hospital East: Vouchers will be available on the first Wednesday of each month, 10 a.m.to noon at the Touchpoint program office at Community Hospital East. Greenfield Senior Center: Seniors may purchase vouchers on the first and second Wednesday of each month at the Patricia Elmore Senior Center, 280 Apple Street in Greenfield. The vouchers are then redeemed during normal cafeteria hours at Hancock Regional Hospital, where special menus have been designated for the program. Hendricks County Senior Services: 1201 Sycamore Lane, in Danville, Seniors are informed as soon as the site receives vouchers. No set days/times while supplies last. Vouchers may be redeemed at Hendricks Regional Health during normal cafeteria hours. Horizon Center-Shelby Senior Center: Vouchers are available each month from 8 a.m. to 4:30 p.m. at the Horizon Center while supplies last and may be redeemed at Major Hospital Monday through Friday during normal cafeteria hours. Heritage Place: Monday through Friday from 8:30 a.m. to 4:30 p.m. while supplies last. Under the age of 60 with a disability and receiving services through CHOICE, SSBG, or Medicaid Waiver. CICOA offers a regular diet only, as well as a nutritional analysis of all menus to empower health-conscious consumers watching calories, fat, carbohydrates, sodium, fiber or calcium. For more information or to arrange delivery, contact 317-254-3660. 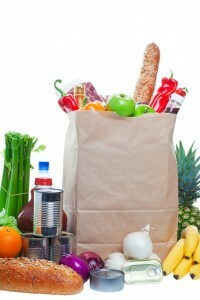 Meals & More is a service of CICOA Aging & In-Home Solutions. As the state’s largest Area Agency on Aging, CICOA’s mission is to empower older adults, those of any age with a disability and family family caregivers to achieve the greatest possible independence, dignity and quality of life. We do this by connecting our clients with community-based resources and services to help them remain comfortably and safely at home and out of institutional care. Through a network of agencies, service groups and volunteers, CICOA provides home care services, home-delivered and neighborhood meals, transportation, home health care, long-term care options counseling, home modifications, respite care and caregiver assistance. To apply for home-delivered meals, contact CICOA’s Aging & Disability Resource Center at 317-254-3660 or toll-free at 800-432-2422. To participate in congregate meals, you may complete the in-take form with the meal site manager at any neighborhood meal site. Farmers Market Vouchers are available to participants at no cost. Benefit will remain $20 with each booklet consisting of four (4) – $5.00 checks. Participants must be 60 years old or over or be a qualified disabled person. A qualified disabled person is enrolled in an AAA program, under 60 years old but over 21 years, living in housing for the elderly and participating in congregate nutrition services. CICOA is a member of Elders At the Table (EAT), a coalition of non-profit organizations dedicated to insuring that every Central Indiana senior who needs assistance getting nutritious meals has that help! By working together we will create a system that meets current needs as well as builds a solid foundation for future planning. The Elders at the Table (EAT) Coalition received a $150,000 grant from the Central Indiana Senior Fund, a CICF Fund, for its Alleviating Senior Hunger initiative. The grant will help EAT implement comprehensive and integrated strategies to increase low-income seniors’ knowledge of and access to nutritious food sources. 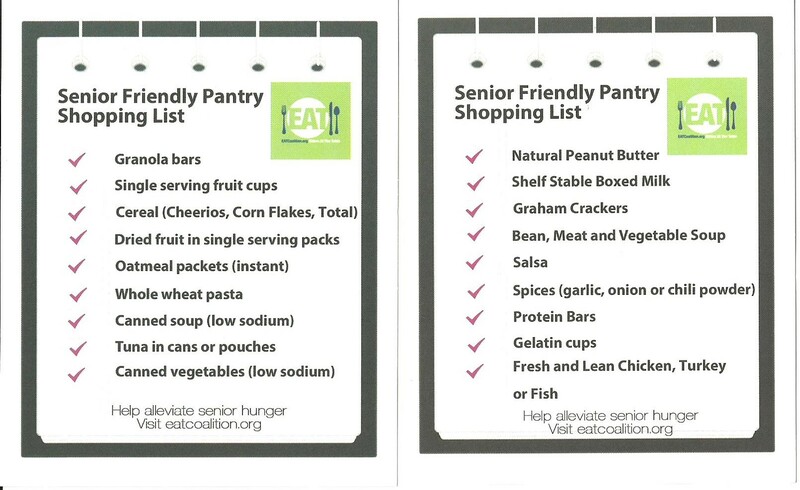 This initiative will be administered through CICOA Aging & In-Home Solutions, Meals on Wheels of Central Indiana and other EAT coalition members. To learn more about EAT and the coalition partners who are committing their time and energies to ending senior hunger, visit www.eatcoalition.org. Hot, nutritious meals are served Monday through Friday at various neighborhood meal sites. Lunch service times vary for each site. Reservations are required, so please contact the phone number on the neighborhood meal sites listing to make a reservation. For information and meal reservations please call the number listed by the site. Lunch: 11:30 AM Mon thru Fr, Noon on Sunday. Sack lunch on Sat. at noon.